ERIC Koi Pond Filtration | Multi-bay filter systems. Here’s a last-ditch attempt from me to genuinely explain why these systems and EVERY other upward-flow filter system in the world can only operate at a maximum of 15% efficiency. Conversely – it also means they are only operating at 85% inefficiency. 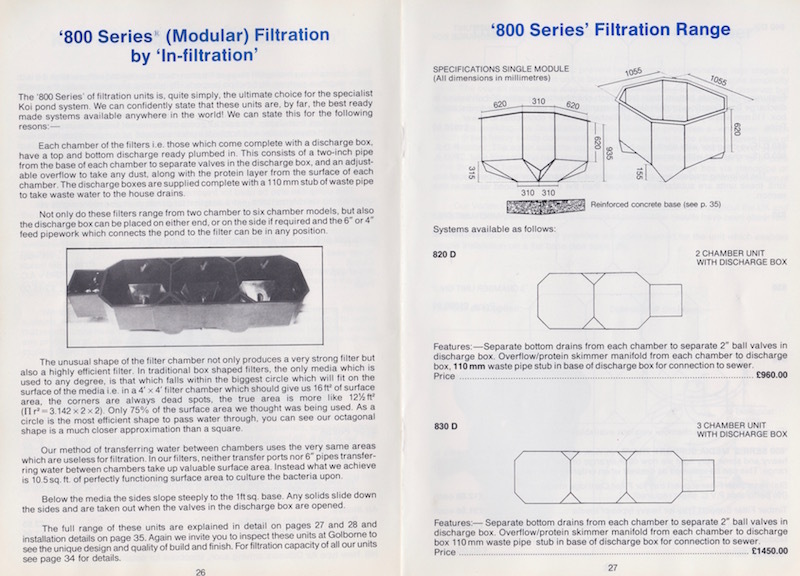 Multi-bay systems are also termed as ‘rise and fall’ filter systems and when I first saw these at the Koi breeder’s farms in Japan during 1979 – I became captivated. 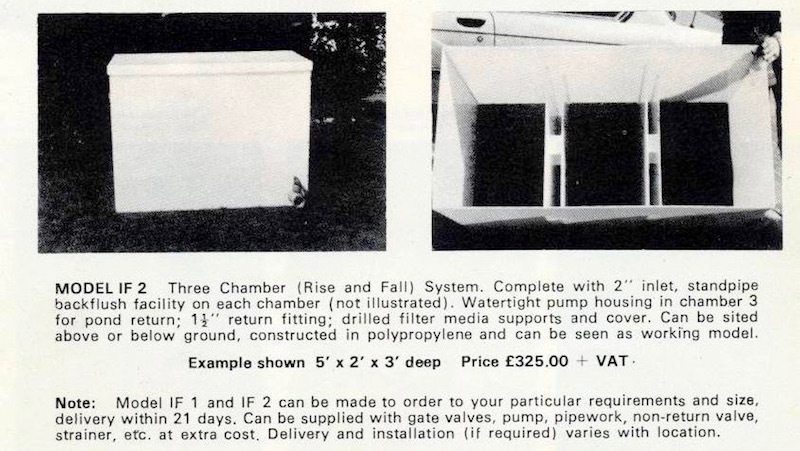 So, by 1982 I was producing and selling these multi-bay filter systems through my Koi outlet (known as Infiltration) – in glass fibre. 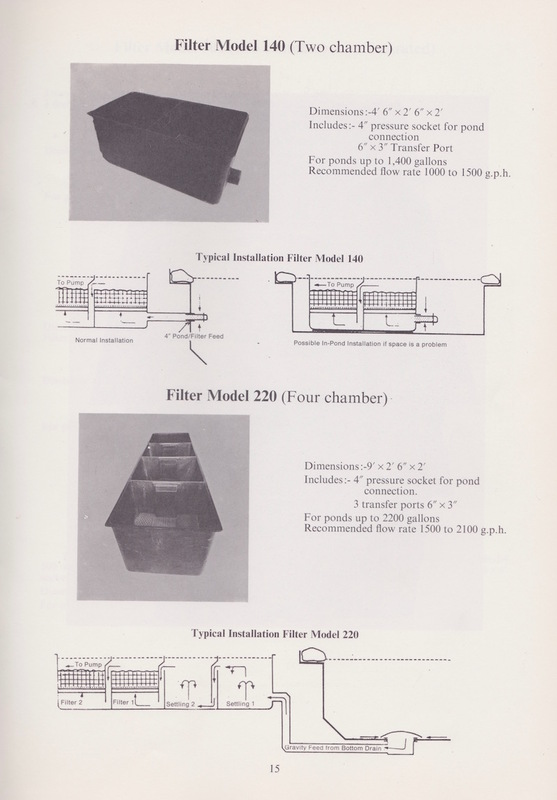 Problem was, I saw these filter systems in Japan during 1979 – they looked simple enough to me – but I couldn’t go into details because I couldn’t speak Japanese and the Koi breeders could not speak English. Had I known the details I would not have produced these systems in the first place. After finally being explained these details I immediately ceased production of these systems. But by then, many other companies had copied them – they still copy them today and many Koi enthusiasts still buy them. ALL pond drains and ALL filter drains in the Japanese breeder’s indoor systems were taken by tubes into a discharge box and stopped by standpipes. The discharge box was connected to the main sewer and when all standpipes were opened (daily) – the wastewater was discharged into the sewer. These indoor systems are only operating for 9 months per year until the Koi stocks are placed into the mud ponds for 3 months. In these 3 months, the indoor ponds are emptied, disinfected and cleaned thoroughly. Pond water enters these rise and fall filters from a side feed in the wall of the pond that’s around half way down the pond wall. The heavier ammonia content plus the fish waste at the base of the pond does not enter the rise and fall filters because these are discharged to waste every day. In short these rise and fall boxes have little to do with filtration as such – and most of the media inside the boxes contains porous sacks of oyster shells that are used primarily to ensure the pH remains stable. Now that these details have been revealed – in detail – it’s easy to see that overseas Koi enthusiasts expect much more from their rise and fall systems. They wish these systems to provide them with perfect water clarity together with perfect water quality and if these people are contented with 15% efficiency then that’s fine. However, for only 15% efficiency it does take up an awful lot of ground space. This illustration below is a typical three chamber multi-bay filter. The blue areas denote filter media and it’s easy to see how water exits the top of the first box and drops down the transfer port into the base of the next chamber. The brown layers on the base of each box show waste matter gradually collecting on the bases. The three red arrows show the only parts of the filter media that are getting a constant supply of pond water and this explains the 15% efficiency. When the system is running, the pond water tracks directly from the inlet to the outlet that’s the transfer port – and this continues to track throughout the system. In truth the only places in the system that we know for certain are getting a constant supply of pond water are the inlets on the base of each box and the outlets to the transfer ports on the top right. Sadly there are no biological surfaces placed at these six points. These filters have 1.5” drain lines to each box at the base of each box where users are asked to flush these to waste regularly. For the first few seconds a brown stain can be seen in the wastewater but a far greater amount of waste matter still remains at the base of the filter. It’s the media in the boxes that prevents the waste matter to be seen. The only way to get this waste out completely is to empty the entire filter to waste, remove the media inside the boxes and then clean it out with a garden hose. If the three blue bands that denote filter media are removed completely, we are left with large areas of white together with the arrows. These large areas of white denote many gallons of stagnant water that have been in the boxes since the very first fill. Thankfully all is not lost and with a little common sense – percentage efficiency can be increased easily, quickly and cheaply. This is not ‘in theory’ – this has been achieved in practise on several occasions. Empty the entire filter to waste. Remove all the existing media. Thoroughly clean the insides of the filter. At the first water entry point to the filter on the base of the box, leave this as is and it will allow the first box to be an ideal settling chamber. But on the next two inlets and the three exit points near the transfer ports add strips of Japanese filter mat to these points. Also ensure you have spare strips to hand. Next fill up the boxes and re-start the filter without placing any other filter media in the boxes. By doing this you will be able to see any debris that’s collected on the bases and you’ll also be able to see how the drain valves can only flush away part of this. A siphon is a much better way of getting rid of the debris that gathers around the bases. This advice will increase the percentage performance of all upward-flow boxes, whether single or multiple. If you do own a multi-bay filter system then why not give this method a try – it costs nothing to do so – and the results will be seen in only a few days?